When it comes to the brutal dictator who has caused a continuing exodus of millions of his countrymen and women, consistently violated political (and most other) prisoners' human rights, sent thousands to firing squads, jailed and terrorized gay Cubans for being gay, completely banned freedom of expression, and forcibly isolated and segregated anyone in Cuba suffering from AIDS into leper-colony type sanatoriums, I am not very objective. But as he has done for decades now, this spectacularly intelligent and incredibly lucky man, even on his almost-deathbed still manages to permeate all levels of news and issues, including art. Last year, this artist in New York apparently had the common "rosy" picture of Fidel Castro and Cuba, that most people who have never informed themselves about the real facts of Cuba and Cuban life under a Communist yoke, usually have. And so he decided to create a massive Castro bust as a sort of an homage to the Cuban dictator. And he planned to unveil the huge homage to Castro in New York's Central Park. See the initial YouTube video here (by the way, if you look in the background, you see that this is the same artist who gave us the pregnant Britney Spears sculpture). Plans for an unveiling in New York's Central Park of Fidel Castro on his 'deathbed' have instead turned into plans for the deconstruction of his effigy in Miami, where he will be prematurely laid to rest. Capla Kesting Fine Arts announces the unveiling of "Fidel Castro's Deathbed Portrait" has been reconsidered by the artist, courtesy of the Miami FM morning show El Traketeo on WRTO 98.3 who protested the sculpture and arranged for the artist to come to their studio to hear the testimonies from several dozen Cuban exiles. A ceremony for deconstruction of Castro's Deathbed Portrait will take place in Miami, November 8th at a time and location designated by WRTO. After hearing hours of face to face testimony from Cuban people who have suffered under Castro, Edwards said on the air at WRTO, "I'm only sorry I wasn't aware of all that pain before my project started. After hearing all these painful accounts, in good conscience, as a friend of the Cuban-American communities, I cannot show the sculpture in Central Park." 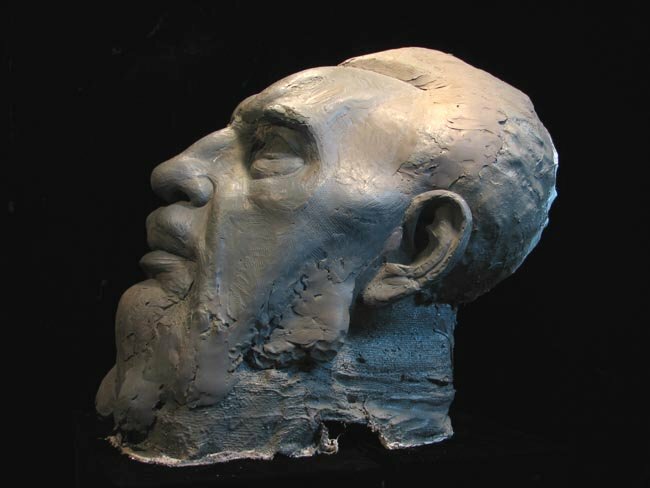 And so, the colossal scaled clay model for "Fidel Castro's Deathbed Portrait" by Daniel Edwards, was instead "deconstructed" in Miami on November 8, 2006. And the lesson here, taught to us by Castro in his deathbed, is that political art, which is more alive and well than many realize, can cover both sides of the political spectrum, and even in some cases, such as this one, switch to the right side of a debate, no pun intended. My kudos to Edwards and to Capla Kesting Fine Art. Swann Galleries is a highly reputable art dealer and auction house and they have 332 lots for sale on Ebay with some real steals (such as a Sam Gilliam starting at $500 Update: It closed at $2600 - still a great deal!). There are quite a few works by African American artists of the caliber of Romare Bearden, Jacob Lawrence, Lois Maillou Jones, Renee Stout and many, many others. By the way, Swann has recently established a new department in their auction house called African-American Fine Art. Also terrific photography by European American photographers Sally Mann, Imogen Cunningham, Walker Evans, Weston, Atget and many others. In Philly, Nexus has completed the move to a new home in the Crane Arts Building in Fishtown. They will we reopen Nexus in their new home and at the same time inaugurate "Second Thursdays," a new monthly event of openings by galleries that are north of Northern Liberties. Their inaugural show in their new digs features two digital exhibitions by Jennie Thwing and Catherine Passante. Through Feb. 25, 2007. Second Thursday will be held February 8th from 6 to 9 PM. They will also be open on First Fridays from 6 to 9 PM. Can a President remake society by Presidential decree? "I think the president is going to do what he wants to do, because he will have all the power to decide on all things," Krakower says. "I think we're headed toward totalitarianism." No, no guys... it's not our president that this CNN article is referring to, but that nutjob in Venezuela: Hugo The Chavez! Though Chavez insists he will respect private property, he plans a new "luxury" tax on everything from second homes to art collections, and the rich will undoubtedly feel the pinch. Just in case we ever decide to tax art collections in this country, I'm curious how the Venezuelan strong man will decide how much an art collection is worth at the time(s) that it is taxed. See Bailey's take on the subject here. Next jurying of new member portfolios for DC's Studio Gallery is mid-February. The Studio Gallery is currently jurying new member artists for its expanded gallery space in Dupont Circle. A thriving cooperative gallery for over 40 years, the new space offers constant membership exposure and a frequent show schedule. The gallery requires active participation of its members. Submissions must include samples of recent work and a CD or slide portfolio. For details contact Carol Rubin at 301-996-7162 or email to c.rubin@verizon.net. The Ullens Center for the Arts, in Beijing (the city formerly known as Peking) is seeking a Curator and also a Head of Events. The Ullens Center for the Arts is developing a most comprehensive contemporary art institution in Beijing with exhibitions, screenings, performances, lectures and seminars, an art library and educational program. They are currently recruiting for the following two positions: Curator and Head of Events.